The author, Al M. Gray is President of Cost Recovery Works, Inc., a provider of Cost Avoidance and Cost Recovery for America’s well-known companies, businesses and governments desiring Superior Returns. 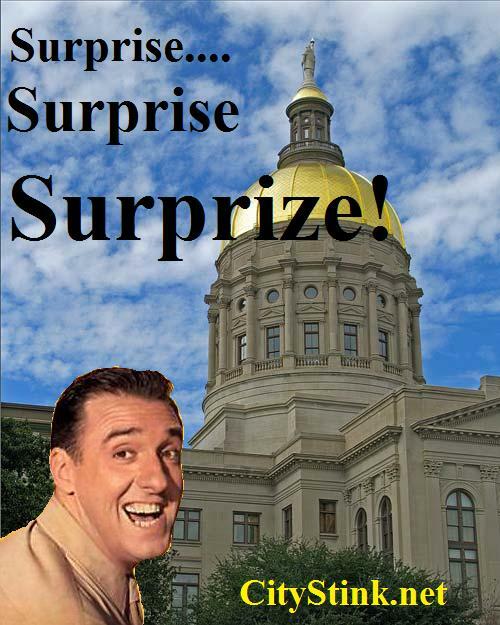 Old Gomer Pyle used to say “ Surprise, Surprise, SURPRIZE!! !” Well, the money trail from Magnolia Trace , LLC to Affordable Equity Partners of Columbia Missouri, might fork, meander, double back, and double CROSS, but the sleuth hounds of Augusta Today and CityStink.net are rarely shaken or even stirred in pursuit. The quarry was found in the bowels of a gold-domed lair in Atlanta. Does this surprise anyone? It shouldn’t. Affordable Equity Partners, Inc. boasts a leadership team headed by Jeffery Smith of parent JES Holdings, with affiliated companies named ES Dev Co, Inc., Fairway Construction Co., Inc., Fairway Management, Inc., and Capital Health Management, Inc. An article on StLouisToday.com exposes how Smith and his companies have played the campaign contribution and lobbying game very well in Missouri to the tune of capturing $26 million for low-income housing projects into 2009. At this juncture, the process of following all of the related parties, employees, PAC’s and agents is not complete. There will be more to come. What is revealed so far by researching these entities’ contributions via the Georgia Ethics Commission Campaign Contributor database? Lt. Governor Casey Cagle got $882.50 from AEP going back to 2008. Sister company Capital Health Management Inc. gave Cagle another $10, 453.50 and gave House Speaker David Ralston $5000 in 2011, this nonelection year. Then there are the PAC’s. Capital Health Management is shown to be the overwhelming contributor to The Fund for Georgia’s Future. The Fund for Georgia’s Future gave Committee to Elect Ben Harbin, $1500 in 2008. The Georgia Link Pac for Good Government got the majority of its funding from Capital Health, too. Disgraced and resigned House Speaker Glenn Richardson’s MMV Fund got $2,500 from The Georgia Link Pac for Good Government. AEP also contributed to the Committee for Affordable Workforce Housing. Strangely, the reported contributions are small, relative to the $tens of thousands doled out to politicians. This PAC gave Columbia County Representative Lee Anderson $450 and Rep. Ben Harbin $1100. Last year, this Committee for Affordable Workforce Housing gave Governor Nathan Deal’s Campaign $6,300. At this juncture, the Augusta Today and CityStink.net team is investigating another Missouri based entity that was noted to be working in conjunction with the AEP affiliate Capital Health Management to fund one of these PAC’s. The company has contributed many thousands of dollars to Georgia’s Legislators. Was it coincidence that Ron Cross, a Nathan Deal supporter, and Trey Allen, Nathan Deal’s Columbia County Campaign Chairman, scurried to meet with Magnolia Trace developers in County Attorney Doug Batchelor’s office? Or did they get calls from Casey Cagle, Nathan Deal, David Ralston, Ben Harbin, and Lee Anderson “encouraging” the meeting and their subsequent resolution in support of this unwanted public housing development? Only the unforeseen and unpredicted are surprises. Below is a a link showing the State of Georgia Housing tax plan that AEP helped write for itself into law. It’s heavy reading for those of you with some time to kill. It may not be the Fourth of July, but expect to hear some loud fireworks over the Columbia County Government Center in Evans tonight. Angry residents from Petersburg Station and other Martinez neighborhoods surrounding the controversial Magnolia Trace low-income rental housing development plan to show up in large numbers at tonight’s commission meeting in protest of the development that was unanimously approved by commissioners last year. They contend that the high density low-income subsidised rental housing will erode their property values, increase crime and put a strain on neighborhood schools. A Facebook Group opposing the development called Say No to Magnolia Trace Housing Project boasts over 225 members and that number appears to be growing by the hour. But will that translate into a large showing at tonight’s Columbia County Commission meeting? Though Commission Chairman Ron Cross appears to be an enthusiastic supporter of the development, Sheriff Clay Whittle and School Superintendent Charles Nagle are being more cautious. There are concerns that the influx of more low-income students into that part of Martinez will make Lakeside High a Title 1 school. Sheriff Whittle also has raised concerns about crime from other rental properties in the county, especially apartment complexes, but is cautiously optimistic given assurances that the Magnolia Trace development will require criminal background checks for applicants. Still, neighbors of Magnolia Trace are not in the least bit “optimistic” and it is still not quite clear if they will be able to stop this development. The Georgia Department of Community Affairs has already issued the subsidies and the development is already under construction. What particularly angers the resaidents is that they were not consulted or made aware of the nature of this development before the commission gave its approval last year. We will have a correspondent covering tonight’s Columbia County Commission meeting and we will bring you the report (including video) as soon as it becomes available. Issue: Citizens presentation Protesting The Magnolia Trace Low Income rental housing development .